There are a lot of posts out there on this specific message but I didn’t find good insights, so hopefully my attempt helps you to find a resolution: try and execute the ‘ALTER RESOURCE GOVERNOR RESET STATISTICS’ command and check again; for me this was sufficient to clear the message an load the data successfully afterwards. If your interested in digging a bit deeper into the Resource Governor values and settings, continue reading! Thinking about this message for a minute, my first thought was, well this could make sense; the default settings of SQL Server will assign a maximum of 25% memory granted to a query. Would it be the case that we simply don’t have enough memory assigned (25% of 200 GB == 50GB) to run this task? 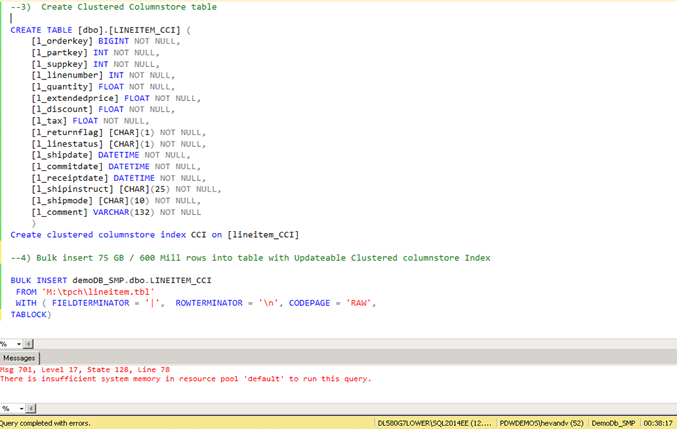 But this isn’t SQL-alike behavior: you would expect worst case, that SQL Server would start to swap data out to disk and report a lot of time spend on some sort of waitstat as the new ‘COLUMNSTORE_BUILD_THROTTLE’ instead? So, to run some investigations I reverted the RG settings back to the default 25% and disabled it. Then noticed that the DMV’s related to the Resource Governor have been enhanced significant in SQL2014; new counters like ‘read_bytes_total’ and ‘write_bytes_total’ have been added to the sys.dm_resource_governor_resource_pools dmv. (for a full description click here). The DMV snapshot nicely shows the ‘Read_GB_delta’ column representing the size of the flat file being processed, and the ‘Write_GB_delta’ column shows the size of the created CCI cq. data written to disk! What is really interesting here is that the input part, the 74 GB flatfile size, has been assigned to the Internal pool, where resource consumption is not restricted in any form, and the actual CCI data, 25 GB has been allocated to the default pool. 25 GB is a value which should have fit easily into the Default Group in the first place, right? So what happened? This indeed updated the statistics_start_time value, so I changed the value in my query above to : ‘Last_Statistics_Update_start_time’ to make it easier to interpret. After the reset, the data loading completed successfully, also with the default settings , so problem solved! Surprisingly after the direct load into the CCI table completed succesfully, not a sign of ‘COLUMNSTORE_BUILD_THROTTLE’ or any of the fancy new waitstats there; just the regular data loading ones! To overcome the ‘There is insufficient system memory in resource pool ‘default’ to run this query. ’ error message please check the sys.dm_resource_governor_resource_pools dmv values. Before increasing the Max. Memory Grant setting first give it a try to update the the Resource Governor statistics with the ‘ALTER RESOURCE GOVERNOR RESET STATISTICS’ command. (And as always.. please let me know your findings! Have experienced this twice in projects. For the non clustered variant. I chose using partitioning as a better choice for one of them because I did not want to risk side effects from allowing too high memory use. On the other, setting max memory temporarily to 90% solved the problem. 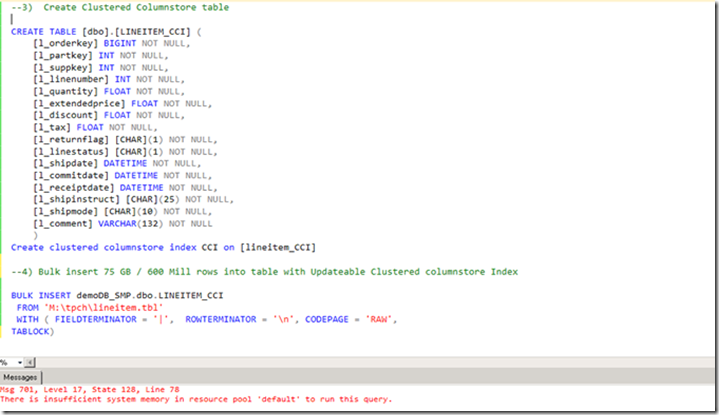 The first time it scared me away from using the column store at all, I did not want to introduce this risk to the client. Maybe this needs a best practice whitepaper in the future. will pass on the whitepaper request. 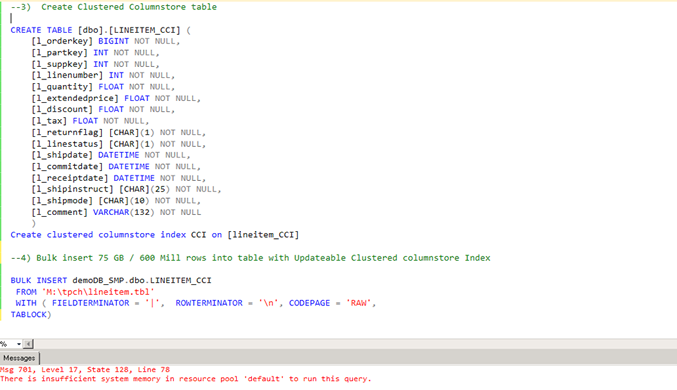 Basically that issue has had nothing to do with a Columnstore but with RG stats. As Gorm, I guess the most people not playing with APS are definitely choosing partitioning in order to get reasonable maintainability as well as the Segment Clustering. it was so helpful. I really appreciate it.